Although IS research acknowledges the importance of path dependence with the generalized response that “history matters,” this broad understanding does not substitute for a more systematic historical analysis of how paths emerge and how technological change breaks them. In this context, we draw on the theory of strategic path dependence from organization and management research to develop a more nuanced understanding of path dependence and then explore how technological change breaks these strategic paths. Based on a narrative analysis of the strategic development of incumbents in the funeral industry, we reconstruct the core components of strategic paths – strategic patterns and self-reinforcing mechanisms – and scrutinize the Internet’s role in breaking these paths. We suggest that technological change helps break strategic paths by destabilizing the very self-reinforcing mechanisms that led to their emergence and reproduction in the first place. Furthermore, by showing that breaking strategic paths involves a subsequent critical event that destabilizes the strategic pattern, we advance a process understanding of how strategic paths are broken. This paper thus provides much-needed historical analyses of IS-related phenomena, offers a more precise and systematic understanding of path dependence in IS research, and yields insights into the process of how strategic paths are broken. In recent years, the notion that “history matters” has become widely accepted in information systems (IS) research (Fuentelsaz et al, 2012; Hirschheim & Klein, 2012). By accepting this notion, IS research thus acknowledges that a firm’s present decisions depend, at least to a certain extent, on decisions made in the past. Accordingly, IS scholars typically use the term “path dependence” to describe and define the impact of a firm’s historical decisions on its present decisions (e.g., Bharadwaj, 2000; Besson & Rowe, 2012; Fichman, 2004; Henningsson & Henriksen, 2011; Kim et al, 2011, 2012; Lim et al, 2011; Lucas & Goh, 2009; Lyytinen & Rose, 2003; Nolan, 2000; Kuk & Janssen, 2013; Peppard, 2001; Sambamurthy et al, 2003; Zhu et al, 2006). The ubiquitous use of this concept in IS research reflects the importance of history: to obtain a better understanding of contemporary IS phenomena, considering the historical background of firms seems indispensable. IS research mainly uses the notion of path dependence in two ways. Some IS scholars describe and explain firm success in terms of path dependence. Studies on the business value of information technology (IT) have highlighted the central role played by path dependence to capture value from IT capabilities; in particular, these studies have shown that a firm must develop and improve its IT capabilities over time to derive value from them and to gain sustainable competitive advantage based on their historical, idiosyncratic, and difficult-to-imitate development (e.g., Bharadwaj, 2000; Kim et al, 2011, 2012; Lim et al, 2011; Pavlou & El Sawy, 2011; Peppard, 2001; Sambamurthy et al, 2003). However, another stream of studies in IS research emphasizes that this very path dependence can become a burden. More specifically, these works posit that past decisions can operate to tightly constrain a firm’s present scope of action – particularly when set in the context of technological change – and lead to its eventual demise as the result of firm inflexibility (e.g., Fichman, 2004; Henningsson & Henriksen, 2011; Kuk & Janssen, 2013; Lucas & Goh, 2009; Mithas et al, 2013; Yoo et al, 2012; Zhu et al, 2006). This burdensome connotation of path dependence became particularly prevalent as Internet usage emerged and became more widespread. By creating new ways of developing, producing, and distributing products and services (Fichman et al, 2014; Tilson et al, 2010; Yoo et al, 2012), this sweeping technological change induced the demise of incumbents in many industries, such as the book industry (Nylén & Holmström, 2015), the camera industry (Lucas & Goh, 2009), the computer industry (Fichman et al, 2014), the cell phone industry (Sørensen & Landau, 2015), the music industry (Oestreicher-Singer & Zalmanson, 2013), and the newspaper industry (Karimi & Walter, 2015). In this paper, we aim to obtain a more precise and systematic understanding of these matters by drawing on the theory of strategic path dependence in organization and management research (Dobusch & Schüßler, 2013; Koch, 2011; Vergne & Durand, 2010, 2011; Sydow et al, 2009). This literature develops the notion that “history matters” by arguing that present decisions should not be understood as independent of past decisions (Godfrey et al, 2016; Kipping & Üsdiken, 2014). However, this paper extends this general notion by specifying and defining path dependence as a process that leads to the emergence and persistent reproduction of strategic patterns (i.e., the routinized re-selection of strategic options) that results from self-reinforcing mechanisms (i.e., positive feedback that leads to an increased re-selection of certain supposedly optimal strategic options) (Sydow et al, 2009; Vergne & Durand, 2010). Prior studies on path dependence in this literature stream have mainly focused on reconstructing the self-reinforcing dynamics through which (formerly) successful strategic paths have emerged (Dobusch & Schüßler, 2013). Furthermore, a few studies have even begun to illuminate how and why firms pathologically reproduce strategic paths, even when technological changes have doomed them to failure (e.g., Koch, 2011; Rothmann & Koch, 2014). However, the question of how paths “break,” i.e., how technological change transforms the successful reproduction of strategic paths into failure, remains poorly understood (Besson & Rowe, 2012; Sydow et al, 2009). Therefore, we formulate the following research question: How does technological change break strategic paths? We address our research question in an empirical analysis of how the Internet has affected the strategic path of the funeral industry in Berlin, Germany. Based on a narrative analysis (Garud et al, 2010; Pentland, 1999; Rowe, 2012), we analyzed the strategic development of this industry beginning in the 1960s. The incumbent firms in this industry generated and successfully reproduced a strategic path for a long period of time. However, beginning in the late 1980s, the industry experienced several critical events, i.e., market deregulation, the market entry of the so-called discount funeral homes, and the emergence and more widespread use of the Internet. Our narrative analysis of the rise and fall of incumbent funeral homes yields insights into incumbents’ predominant strategic pattern, the self-reinforcing mechanisms that led to the emergence of this pattern, and the role played by the Internet in breaking the strategic path. Our analysis of this historical development illustrates that technological change helps break strategic paths by destabilizing the self-reinforcing mechanisms through which the dominant strategic pattern historically emerged. However, our results also indicate that destabilizing the self-reinforcing mechanisms through technological change is a necessary but not sufficient condition to break the strategic paths. As we will explain, breaking strategic paths involves a succeeding critical event that destabilizes the strategic pattern. Thus, our analysis suggests that strategic paths are broken by means of a process in which several critical events – including technological, administrative, and structural events – sequentially destabilize self-reinforcing mechanisms and strategic patterns. Our study makes several contributions to the literature. First, by reconstructing the historical development of the strategic path of incumbent funeral homes, our study reduces the lack of historical perspectives in IS research (e.g., Hirschheim & Klein, 2012; Misa, 2007). Based on our narrative analysis of the rise and fall of incumbent funeral homes, we suggest that understanding the path breaking impact of technological change requires reconstruction of how the affected strategic path emerged initially and highlight the importance of the historical background to the development of IS-related phenomena. Second, by engaging the theory of strategic path dependence, our study generates a more precise and systematic understanding of path dependence itself, which has remained an important contemporary phenomenon that is, nonetheless, incompletely understood in IS research (Besson & Rowe, 2012; Singh et al, 2015). More precisely, by drawing empirical attention to self-reinforcing mechanisms, strategic patterns, and the destabilization of both, our empirical analysis provides more specific explanations for both the emergence and the breaking of strategic paths that extend beyond broad reference to the notion that “history matters.” Third, our results complement the literature on the emergence and reproduction of strategic paths (e.g., Dobusch & Schüßler, 2013; Rothmann & Koch, 2014) by developing a better understanding of how strategic paths break. Specifically, our results indicate that breaking strategic paths is not induced by a single critical event but instead unfolds as a process in which several critical events sequentially destabilize self-reinforcing mechanisms and the strategic pattern. Finally, our results also offer some insights to practitioners. Specifically, given that breaking strategic paths occurs as a process instead of as a single disruptive event, the destabilization of self-reinforcing mechanisms signals the opening of a time window for path-dependent firms; within this time window, firms can avert the harmful consequences that later destabilization of the strategic pattern might induce. However, as our case study indicates, this time window cannot be used solely to engage in activities that aim to recover the former success of the established strategic path; instead, the early warning sign may signal the need to implement strategic change such that the affected firms can extend beyond their strategic path. As Fuentelsaz et al (2012, p. 100, emphasis in original) recently noted, “it is relatively common to talk about […] path dependence […] simply [as] history matters” in IS research. Therefore, IS research typically defines and refers to path dependence as the impact of historical developments on present decisions (e.g., Bharadwaj, 2000; Besson & Rowe, 2012; Lim et al, 2011; Lucas & Goh, 2009; Zhu et al, 2006). For instance, Lim et al (2011, p. 51) referred to path dependence by arguing that present decisions are “a consequence or functions [sic] of the [firm’s] own history.” Similarly, Zhu et al (2006) defined path dependence by positing that present decisions (of technology adoption) are simply a function of previous decisions. These understandings of path dependence suggest that present decisions depend on past decisions to a certain extent. IS scholars mainly invoke this understanding of path dependence in two ways. Some scholars refer to path dependence as a major factor in firm success (e.g., Bharadwaj, 2000; Kim et al, 2011, 2012; Lim et al, 2011; Pavlou & El Sawy, 2011; Peppard, 2001; Sambamurthy et al, 2003). For instance, in a study on bridging the gap between IS organization and other parts of a firm, Peppard (2001, p. 266) argued that “there is a significant element of path dependency in creating high performance from IS.” Bharadwaj (2000) specified the important role of path dependence in the relationship between IT capabilities and firm performance. In particular, she stressed that “[t]echnical and managerial IT skills […] are perfected over time. […] There is no known way to shortcut these path dependent processes” (pp. 173) and that IT capabilities “can only be imperfectly imitated by competitors due to isolation mechanisms such as […] path dependencies” (p. 186). Thus, Bharadwaj (2000) posited that it is the very path-dependent nature of developing IT capabilities that allows firms to improve these capabilities over time and to create barriers to imitation because their development is historically idiosyncratic. Lim et al (2011, p. 47) provided empirical support for “path dependence as an isolating mechanism that leads to durable resource heterogeneity of dynamic organizational IT capability.” Kim et al (2011, p. 490) argued that path dependence serves as “a springboard for competitive advantage” due to the sustainable resource heterogeneity generated by idiosyncratic historical developments. However, other IS scholars contend that the very path dependence that has generated superior performance may eventually become a burden (e.g., Fichman, 2004; Henningsson & Henriksen, 2011; Kuk & Janssen, 2013; Lucas & Goh, 2009; Mithas et al, 2013; Sambamurthy et al, 2003; Yoo et al, 2012). For instance, with regard to the potential that firms might have to exploit technological opportunities, Sambamurthy et al (2003, p. 241) cautioned that “[p]ath dependencies limit the range of strategic alternatives for firms [because] managers narrow the range of actions to only those that have worked well in the past,” thereby excluding emerging technologies as viable strategic alternatives. Lucas and Goh (2009, p. 53) explored and illustrated this issue using the case of Kodak. In particular, these authors showed that Kodak failed because the company moved along a successful “historical path” of producing technologically superior analog cameras and that “Kodak’s success in the past turned into core rigidities” when the emergence of digital technologies eventually took over the camera market. This compelling case illustrates that path-dependent firms seeking to avoid their own demise must engage with such industry-shifting technological change by implementing strategic and organizational change themselves (Rowe, 1994). However, as Mithas et al (2013, p. 532) observed, “it is all too easy for executives to let historical paths shape their current strategies, even if the environment has changed drastically.” Therefore, Yoo et al (2012, p. 1405) warned of path dependence as “creating further resistance to change” in a digital age that has been spurred on by the Internet, which demands that firms respond flexibly. These uses of the notion of path dependence in IS research suggest that such research highlights the importance of idiosyncratic streams of past decisions, which serve to reveal either firm success or firm inability to respond to technological change. Thus, the general understanding of path dependence in terms of “history matters” depends on the central role of past decisions to gain a better understanding of contemporary IS phenomena. However, it also ignores a more systematic understanding of path dependence that extends beyond a holistic reference to idiosyncratic streams of past decisions because it does not specify how paths emerge and how technological change transforms path reproduction from a cause of firm success into a hindrance. Furthermore, historical accounts that reconstruct path-dependent processes are underrepresented in IS research (Hirschheim & Klein, 2012), even among those historians who examine the history of computing (Misa, 2007). Therefore, we know little about how paths emerge and how technological change eventually breaks them (Besson & Rowe, 2012). To shed additional light on these issues, we next turn to the theory of strategic path dependence from organization and management research to elucidate a more systematic understanding of path dependence. Strategic path dependence is a process in which the managerial scope of action gradually narrows over time (Sydow et al, 2009; Vergne & Durand, 2010). Although this definition of strategic path dependence complies with the idea that “history matters” (Godfrey et al, 2016; Kipping & Üsdiken, 2014), the literature extends further by specifying and defining two core components of strategic paths that render path dependence accessible to investigation: the strategic pattern and self-reinforcing mechanisms (Koch, 2011). Strategic pattern refers to routinized re-selection of strategic options (Sydow et al, 2009). In turn, strategic options represent specific product/market combinations, such as developing and producing a certain product or service and selling it to a specific group of customers (Koch, 2011). Thus, from this perspective, strategic path dependence leads to the emergence and persistent reproduction of a strategic pattern (Sydow et al, 2009; Vergne & Durand, 2010). In addition, the theory of strategic path dependence draws on early work by Arthur (1989) and David (1985) to prioritize self-reinforcing mechanisms (Dobusch & Schüßler, 2013), which involve positive feedback regarding the selection of strategic options (Schreyögg et al, 2011), such as an increased market share after a strategic move or reduced per-unit production costs after production expansion. Once self-reinforcing mechanisms have been initiated, they make re-selecting successful strategic options increasingly attractive and diminish the attractiveness of selecting alternate strategic options (Dobusch & Schüßler, 2013). When self-reinforcing mechanisms have crowded out all strategic alternatives, affected firms enter a lock-in phase in which they persistently reproduce a strategic pattern and hardly even notice that alternatives exist to the prescribed course of action (Sydow et al, 2009; see also Figure 1). Emergence of strategic paths (Sydow et al, 2009, p. 692). At first, the narrowed scope of strategic options typically does not necessarily adversely affect firm success. In fact, achieving firm success by exploiting self-reinforcing mechanisms constitutes the essence of strategic path dependence (Sydow et al, 2009) and leads to resource accumulation and the ability to deploy resources efficiently. Accordingly, firms may successfully reproduce a strategic pattern that dovetails with specific environmental conditions for long stretches of time (Koch, 2011; Rothmann & Koch, 2014). In so doing, path-dependent firms might potentially “break” the path by engaging in deliberate intra-firm activities that include “the insertion of at least one alternative course of action” (Sydow et al, 2009, p. 702; see also Beyer, 2010; Vergne & Durand, 2011). However, as Sydow et al (2009, p. 702) clarified, “the idea of deliberately breaking a path is self-contradicting” from the perspective of strategic path dependence: Apart from emergent (Pentland et al, 2012) or coincidental (Sydow et al, 2009) deviations from the strategic path, there should be little incentive for path-dependent firms to deliberately generate and exploit attractive strategic options that extend beyond successfully reproduced strategic patterns (Rothmann & Koch, 2014). In this vein, Vergne and Durand (2010, p. 743) defined the impact of an “exogenous shock [that] disturbs the system” and, thus, creates willingness to generate attractive strategic alternatives as a core condition of deliberately escaping the strategic path. Related to this core condition, the strategic path dependence literature suggests that the constrained potential for innovation can become problematic and may spur strategic change when the strategic path is broken by an external critical event. In other words, an incisional change in the environment might result in a misalignment of the strategic pattern with environmental conditions and threaten the successful reproduction of the strategic path (e.g., Rothmann & Koch, 2014; Sydow et al, 2009; Vergne & Durand, 2010; Weick & Quinn, 1999). However, as Sydow et al (2009, p. 695) suggested, such events cause a “dysfunctional flip […] from initial[ly] reinforcing earnings to strong barriers to change and losses.” Thus, the theory of strategic path dependence suggests that when events make the reproduction of strategic paths problematic (or even counterproductive), it is difficult – if not impossible – for affected firms to respond to these technological and social changes in the environment because they have forfeited their flexibility in favor of self-reinforcing mechanisms (Koch, 2011). Thus, the externally induced form of “breaking” strategic paths dovetails with deliberate intra-firm efforts to escape narrow strategic corridors in that the likelihood of escaping the strategic path is low. Nonetheless, path breaking as the result of the onset of outside events differs from deliberate path breaking because the former does not focus on a path-dependent firm’s (narrowly based) attempts to generate new strategic options but instead means the destruction of existing strategic paths. Given that strategic path dependence is actually a driver of firm success in the absence of critical events, this process becomes burdensome only when strategic paths are broken as the result of external events (Rothmann & Koch, 2014; Vergne & Durand, 2010). Nonetheless, prior research has devoted little systematic attention to explaining how external events can break strategic paths, despite the key role they play in this process. Instead, the extant literature on strategic path dependence primarily focuses on describing and explaining the emergence of strategic paths before they are broken, and in so doing, it emphasizes and reinforces the formative role of self-reinforcing mechanisms in this process (Dobusch & Schüßler, 2013). Although technological, administrative, and structural changes can help break strategic paths (Rowe, 1994), the literature tends to emphasize the emergence of incumbents’ strategic paths that are broken as the result of technological changes in the environment (Tripsas & Gavetti, 2000; Gilbert, 2005; Koch, 2008, 2011; Schreyögg et al, 2011; Rothmann & Koch, 2014; Wenzel, 2015). For instance, in the newspaper industry, the strategic pattern of producing and selling news in paper-based formats and offering it to both advertising customers and readers emerged as part of the so-called advertising–circulation spiral in which news publishers subsidized their product by accepting payment for advertising, and readers thus paid for only a fraction of the costs of producing and distributing the newspaper. This ad-based subsidy enabled news publishers to extend their circulation and attract even more advertising customers. The long-standing success of this ad-focused strategic pattern makes offering for-pay digital news unattractive to news publishers (Rothmann & Koch, 2014). A few studies have also shed light on the retention of strategic paths even after they have been broken by technological changes in the environment (Koch, 2011; Rothmann & Koch, 2014; Wenzel, 2015). For instance, when the newspaper industry was struck by increasing competitive pressure from digital news offerings and was suffering from a slump in the advertising market, news publishers transferred their ad-driven business model from the analog world into the digital sphere, which meant that they subsidized digital news by providing the content for free to extend their circulation and to render their news Web sites attractive to ad customers (Koch, 2011). Rothmann and Koch (2014) explained this persistence by arguing that the strategic premises on which the news publishers had previously based their ad-focused strategic pattern remained unchanged. Wenzel (2015) extended this idea by exploring several mechanisms that explain how and why path-dependent firms do not challenge the underlying strategic premises on which their strategic patterns are grounded. In summary, the extant literature on path dependence addresses the emergence of strategic paths before – and their reproduction after – they are broken by technological change. However, little is known about how technological change breaks strategic paths. Against this backdrop, we explore this issue empirically. To empirically examine how technological change breaks strategic paths, we conducted a qualitative case study with a longitudinal retrospective research design (Yin, 2014). Case study research with this particular design seemed to be particularly suited to our research purpose because it allowed us to acknowledge the historical background of the focal phenomenon (see Hirschheim & Klein, 2012) and to observe the processual nature of strategic path dependence (Sydow et al, 2009) by reconstructing how a focal strategic path emerges and how it can eventually be broken by technological change. Furthermore, developing and analyzing rich narratives was essential to generate informed insights about the focal phenomenon. We adopted a realist approach to narratives (Vaara et al, 2016) pursuant to which we understand narratives as texts that represent and “describe a progression or sequence of events” (Pentland, 1999, p. 712). From this perspective, narratives provide ontological access to causal explanations, thus requiring researchers to interpret narratives to gain access to them. In light of the complex nature of the process through which technological change breaks strategic paths (Utesheva et al, 2016), it allowed us “to better understand the complexities” (Vaara et al, 2016, p. 528) involved in the focal phenomenon (see also Garud et al, 2010; Pentland, 1999; Rowe, 2012). Furthermore, it “help[ed] us learn how history matters” (Hjorth & Dawson, 2016, p. 1092, emphases added). In that respect, developing and analyzing narratives helped us reconstruct the flow of events resulting in the focal strategic path being broken. Given that this narrative approach is part of the broad set of a case study’s analytical strategies (Vaara et al, 2016), the research methodology and the retrospective design reinforced the development and analysis of narratives as a means to reconstruct both how the focal strategic path emerged and how it was later broken by technological change. In this study, we focused on the funeral industry in Berlin, Germany. The strategic path of its incumbent firms constitutes a “revelatory case” (Yin, 2014) that illuminates a focal phenomenon that is not always within an observer’s easy grasp (e.g., Schreyögg & Kliesch-Eberl, 2007) but is, nonetheless, accessible to investigation. Specifically, the firms in this industry persistently reproduce a strategic path and have been affected by a number of critical events, including the emergence and more widespread use of the Internet, which eventually played a role in breaking the strategic path. In particular, we analyzed how this technological change affected the strategic path of incumbent funeral homes in Berlin, Germany, by reconstructing the strategic development of these firms over a period beginning in the 1960s and lasting until 2010. With more than 150 mostly family-owned funeral homes, each of which employs on average of six employees by the end of this period, the industry in this region not only accounted for the highest density of funeral firms in Germany but also was hit even harder by technological change than the rest of the industry (Akyel, 2013). Thus, we were able to observe how technological change breaks strategic paths more clearly within this regional scope than within other regions. As with other mature and long-established industries with path-dependent firms (Koch, 2008; Vergne & Durand, 2011; Rothmann & Koch, 2014), incumbent firms in the funeral industry in Berlin were equally affected by certain critical events, engaged in similar strategic activities in response, and relied on the same self-reinforcing mechanisms (Breuer & Daumann, 2010). Thus, although the funeral homes slightly differed with regard to certain structural aspects, such as firm size and ownership structure, they reproduced the same strategic path. This lack of variation did not allow us to draw inferences from cross-case comparisons (e.g., Eisenhardt, 1989). Therefore, following suggestions in the previous literature to shed light on the focal phenomenon by taking a process view (Besson & Rowe, 2012; Utesheva et al, 2016), we analyzed within-case variations (Langley, 1999) by comparing and contrasting the critical events, including technological change, that struck all firms equally in the industry over time as a holistic single case (Yin, 2014) in which the strategic path of incumbent funeral homes was the unit of analysis (Koch, 2008). We gathered the qualitative data for this study as part of a larger research project that was examining the strategic development of Berlin’s funeral industry (see also Wenzel, 2015). Specifically, we collected data from newspaper articles, interviews, and direct observation. In line with a realist approach (Vaara et al, 2016), we collected these data to obtain a better understanding of the context in which the incumbents in the focal industry operated, to develop a rich narrative that would help us reconstruct the emergence of their strategic path, to determine how this path was eventually broken by technological change, and to verify that the narrative was interrelated with the firms’ “real” course of action (see also Koch, 2011, and Sydow et al, 2012, for similar data collection procedures). First, to obtain a better understanding of the context in which the disruption of the strategic path occurred, we collected related newspaper articles from established databases (LexisNexis, Wiso) based on keywords such as “funeral industry AND Berlin” and “funeral home AND Berlin.” We read all the articles found through this search, saving the 399 most relevant articles for further analysis. In our case description, we refer to these articles as Articles 1 to 399. We complemented these articles with secondary quantitative data on developments in the funeral industry in Berlin that were provided by the Federal Statistical Office of Germany (Destatis). Following the suggestions from Yin (2014) regarding reconstructions of historical developments, we used these quantitative data to develop a general overview of industry trends. This overview helped us prepare a number of questions for subsequent interviews in which we obtained a deeper understanding of these trends; i.e., we asked interviewees to name and describe critical events during those periods in which revenues and other figures dramatically rose or declined (although we did not explicitly state that we had identified performance variations during these periods). Second, as illustrated in Table 1, we gathered primary data by conducting 25 semi-structured, retrospective interviews with 14 experts from the focal industry, i.e., actors with knowledge about the historical strategic development of incumbent funeral homes. Interviewing these experts was both necessary and important in light of the empirical challenge that many actors do not fully recall the historical strategic development of their firms and the industry in which they are embedded (see also Sydow et al, 2012). As these experts either experienced this development themselves or carried on the knowledge of their ancestors, their narrative accounts of the strategic development of incumbent funeral homes helped us reach a more well-rounded understanding with regard to how the strategic path of incumbent funeral homes emerged and how technological change eventually broke it. In our case description, we refer to these experts as Experts 1 to 14. We identified these experts either because they were often interviewed as experts in newspaper articles or based on the recommendations made by industry associations (e.g., Miles & Huberman, 1994). We conducted the interviews in 2013 and 2014. To reduce retrospective bias and to ensure trustworthiness through triangulation (see Yin, 2014), we also selected these interviewees because they offered diverse insights into the focal phenomenon; more specifically, these interviewees were characterized by a variety of professional backgrounds and therefore engaged with the incumbent firms in the funeral industry in different contexts. As a result, in addition to interviewing nine funeral directors who provided detailed descriptions of their firms’ strategic development and their perspectives on critical events, we also conducted interviews with four heads of industry associations (three of whom were also funeral directors), one consultant, two suppliers, one publicist (also a funeral director), and one cemetery administrator (see Table 1). Each interview lasted an average of approximately 87 min, while all the interviews together lasted more than 36 h in total. We audio-recorded and transcribed all but two of the interviews. Because one interviewee did not permit us to make an audio recording, we recorded the two interviews with this person in writing, and the interviewee verified the protocol (see Miles & Huberman, 1994). aInterviews with Expert 2 were conducted jointly with Expert 1.
cThe second interview with Expert 10 was conducted jointly with Expert 7. Therefore, the total number of interviews was reduced by one. To ensure the existence of narratively reported courses of action (Koch, 2011), we supplemented the interview data with direct on-site observations at ten funeral homes. We selected these funeral homes based on recommendations by the interviewed experts (see Miles & Huberman, 1994). Although most funeral directors limited our access for data collection to one hour, we entered two paradigmatic funeral homes (Yin, 2014) for two full workdays each and observed all the activities comprising the firms’ value chain, from the first contact with customers to the final delivery of service at the cemetery. We recorded our observations contemporaneously in field notes and summarized these notes in extended reports at the end of each observation day (Miles & Huberman, 1994). To further clarify and improve our emerging research results, we continuously contacted the experts informally by telephone and conducted follow-up interviews with all the experts interviewed. Our data analysis did not follow a linear procedure; instead, it was iterative in nature, moving back and forth between different analytical steps and between data, the extant literature, and emerging theory. However, our analytical approach can be split roughly into the following stages: narrative development regarding the strategic development of incumbent funeral homes, analyzing this narrative from the perspective of strategic path dependence, and analyzing the critical events (including technological change) that broke the strategic path of incumbent funeral homes. In the first analytical step, we developed a narrative (Langley, 1999; Pentland, 1999) regarding the strategic development of incumbent funeral homes. More specifically, we combed through our data to gather key events in the history of the focal industry that had been reported either by our interviewees or in newspaper articles. Then, we chronologically ordered these events and drafted our narrative following this chronology. In the spirit of “thick description” (Geertz, 1973), we aspired to include as much detail as possible in our narrative. Therefore, whenever we felt that we required more information regarding the strategic development of the incumbent funeral homes, we went back to the data to fill these gaps and enrich our narrative using these insights. Given our interest in how technological change breaks strategic paths, i.e., how this type of critical event renders the reproduction of a strategic path unsuccessful or even counterproductive, we also grouped the chain of events into periods in which incumbent funeral homes were reported to be more or less successful. As the interviewees consistently referred to the period from the 1960s to the late 1980s as the “golden decades” (Expert 6) or the “golden years” (Expert 12) and the period that followed as the years of “decline” (Expert 2), “upheaval” (Expert 1), and “demise” (Expert 3), we temporally bracketed (Langley, 1999) this narrative accordingly. Constructing a narrative provided us with the first means of abstracting from the data (see Langley, 1999). Concurrently, we attempted to link the narrative back to the data to enrich it with empirical evidence. Therefore, we continuously revisited our data to directly quote the interviewed experts and newspaper articles whenever it did not harm the narrative’s readability. We translated these quotes from German into English. Next, we aimed to make sense of the narrative from the perspective of strategic path dependence. In particular, we turned our attention to the two core components of strategic paths: the strategic pattern and self-reinforcing mechanisms (Koch, 2011). To identify the incumbent funeral homes’ predominant strategic pattern, we revisited our narrative by searching for the strategic options that these firms re-selected over time. In particular, we searched for specific product/market combinations to which incumbent funeral homes adhered (see Koch, 2011). Once we identified such a pattern, we focused on those self-reinforcing mechanisms that drove the emergence and reproduction of this strategic pattern; in other words, we looked for positive feedback that the incumbent funeral homes received regarding the preferred product/market combination and therefore rendered re-selecting this strategic option more attractive (see Schreyögg et al, 2011). As the identification of strategic path dependence also required us to detect critical events in the environment, such as technological change, that broke or might have broken the strategic path and then to observe the inability of the affected firms to change their strategic pattern (Koch, 2008), our narrative also accounted for how the incumbents responded to the following four critical events that we identified and described in the second half of our narrative: the 50% reduction in funeral allowances (1989), the market entrance of “discount funeral homes” (1990s), the emergence and more widespread use of the Internet (end of the 1990s), and the elimination of the funeral allowance (2004). In so doing, we observed that the focal firms attempted to recover the former success of their strategic pattern rather than changing that pattern, thus providing strong indications of strategic path dependence (see also Rothmann & Koch, 2014). Overall, this analytical procedure helped us not only to verify and reconstruct the emergence of the strategic path over time but also to identify and focus more closely on those critical events that broke the strategic path. In examining the incumbent funeral homes’ responses to the critical events in the narrative, we took note that the four identified events that threatened the successful reproduction of the strategic path had different types of immediate – or even no – impact on the strategic path of incumbent funeral homes. More specifically, although all four critical events threatened the successful reproduction of the strategic path of the incumbent funeral homes, only the later events eventually contributed to breaking the strategic path. To obtain a better understanding of these differential impacts (see Pentland, 1999), we compared and contrasted the roles played by these events in breaking the strategic path of incumbent funeral homes in tabular format (Langley, 1999). In particular, we constructed a table in which we gathered quotes from our coded data that illustrated how these events affected the strategic path of incumbent funeral homes (see Table 2). In so doing, we focused on their impact on the two key components of strategic paths, i.e., the predominant strategic pattern and the self-reinforcing mechanisms (Koch, 2011). By comparing and contrasting the impact of the critical events on these components, this analytical strategy helped us discern the important role that technological change – in our case, the emergence and more widespread use of the Internet – can play in breaking strategic paths. Furthermore, as it became clear from our previous path analysis of the narrative that technological change did not break the strategic path alone but instead triggered defensive responses that aimed to recover the former success of the strategic pattern, we turned our attention to the succeeding critical event, the elimination of funeral allowances, and its role in breaking the strategic path. By comparing and contrasting this critical event with technological change in terms of their separate effects on the focal strategic path, we took note that both critical events contributed to breaking the strategic path but in different and complementary ways: The emergence and more widespread use of the Internet affected the self-reinforcing mechanisms, and the elimination of the funeral allowance affected the strategic pattern. Then, we compared and contrasted the latter critical event with the other critical events that occurred before the emergence and more widespread use of the Internet. In so doing, we first noticed that both the market entrance of discount funeral homes and the elimination of funeral allowances had considerable potential to destabilize the strategic pattern. However, these critical events differed because the self-reinforcing mechanism that drove the emergence and reproduction of the strategic pattern remained intact when discount funeral homes emerged but not when funeral allowances were abolished. Based on this observation, we gained a process understanding of how strategic paths are broken in which self-reinforcing mechanisms and the strategic pattern are sequentially destabilized by critical events, including technological change and other types of change in the environment. In this section, we present our narrative in which we describe the strategic development of incumbent funeral homes in Berlin. To obtain insights into how technological change breaks strategic paths, we then provide our interpretation of this narrative. Thus, this “non-aggression pact” made funeral homes adhere to their established customer base and prohibited them from actively pursuing new customers through marketing or other aggressive activities. Moreover, this tacit “non-aggression pact” suppressed competition in the industry, which would otherwise have been high due to the high density of funeral homes in the Berlin region. Furthermore, it ensured that regular customers would be less inclined to switch providers, which generated steady revenues for the incumbent funeral homes through follow-up orders. The more firms that complied with this code, the more attractive it became to avoid active customer acquisition strategies outside of their “catchment area” (Expert 8) and to offer undifferentiated funeral packages to “regular customers” (Expert 4) in their vicinity. These circumstances also meant that they could only passively enlarge their customer base without breaching the non-aggression pact by having “a strong reputation” (Expert 5). In other words, “[the business] strongly relies on [the] recommendations” (Expert 1) of satisfied customers because testimonials from satisfied customers helped the funeral homes retain existing and acquire new customers. The success of the incumbent funeral homes was threatened for the first time in 1989, when statutory “funeral allowances were cut in half” (Expert 8). Before this cut, burials were understood as the responsibility of the state, as “funeral allowances had been a fixed part of statutory social services since Bismarck’s social reforms in the second half of the 19th century” (Article 2). Legislators pushed through the 50% reduction in funeral allowances by arguing that they were “non-insurance benefits” (Article 2), thereby shifting the financial responsibility for burials to the bereaved – “death as a private issue, so to speak” (Expert 5). The potential increase in consumer price sensitivity that the newly limited financial freedom would likely cause might have made consumers switch providers more easily, which might have, in turn, therefore threatened the dependable and profitable adherence of regular customers. However, “there was no problem” (Article 198) for funeral homes, at this time, because the non-aggression pact was still “respected and enforced in the industry” (Expert 12). Thus, funeral homes continued to rely on their established clientele instead of actively pursuing new customers, thus avoiding a price war. Furthermore, funeral homes and their offers still “hardly differ[ed]” (Expert 8), i.e., the uniformity of funeral homes’ offers continued to give customers little incentive to switch to competitors. As a result, the 50% reduction in funeral allowances, by itself, meant little insofar as changing the funeral homes’ competitive situation was concerned, except for the fact that customers now had to pay a larger portion of the services on their own. Opportunities to compare offers and switch to competitors might also have emerged for consumers when the so-called discount funeral homes entered the market at the beginning of the 1990s. These new market players aimed to offer “funerals at a low-priced rate” (Article 83), in part “by bringing the dead bodies to the Czech Republic for cremation because it’s simply cheaper there” (Expert 10). In contrast to incumbents who relied on their established clientele, these new market players attempted to aggressively acquire new customers in the incumbents’ established catchment areas. Thus, by promoting their businesses with low-budget offers, these players gradually lowered consumers’ price expectations – including those of the incumbents’ regular customers – independently of disposable income and of institutional differences: “There are differences between [Berlin’s] districts. […] But the trend is the same in these areas: [a funeral] should not cost anything anymore” (Expert 8). However, given the limited role that discount funeral homes continued to play at that time, these new players did not immediately affect the incumbents’ business, as the non-aggression pact was not affected and thus continued to ensure to a notable extent that regular customers would return to the incumbents in the regional vicinity. Although the discounters’ market entry threatened the business of the incumbent funeral homes, these funeral homes’ economic circumstances did not drastically change until the end of the 1990s (see Figure 2) when “discount funeral homes gained a dominant market position” (Expert 4) by exploiting the Internet to make their offers. Revenues per funeral home in Berlin in EUR (see also Wenzel, 2015, p. 272). As funeral homes suddenly became rivals with one another, serious and tenacious price competition emerged. Now, “prices are displayed in the window, like at a gas station” (Expert 6), “which drove down […] the margins” (Expert 7) on incumbents’ offers. To “survive in this price war” (Article 120), incumbents reacted by reducing the prices of their funeral packages. Furthermore, they aimed to strengthen their reputation to compensate for the collapse of the non-aggression pact by emphasizing their reliable services to “regular customers […] or customers that recommend us” (Expert 4). For this purpose, incumbent funeral homes – albeit hesitantly – also began to become more engaged with the Internet. Specifically, they aimed to further strengthen their reputations by sending favorable signals on their Web sites (“Established since” and labels of ISO certification) to attract and retain new customers; they also engaged in a new tactic called “search engine optimization” (Expert 1) to achieve a higher ranking in Internet search results. Along with the impact of the environmental changes described above, incumbents also understood that this shift in the financial burden for funerals from the state to private citizens intensified consumers’ price sensitivity. Without the compensating non-aggression pact that reduced competitive pressures to a minimum and contributed to impeding customers from switching to other funeral homes, it was no longer economically feasible to offer standardized funeral packages to an established customer base. As consumers were bound even less to incumbent funeral homes in their vicinity and could now also compare offers on the Internet, it became easier for them to switch to competitors that offered funeral services at lower prices. Thus, funeral homes considered that eliminating the funeral allowance was a critical “upheaval in the market” (Expert 1) that intensified the crisis for funeral homes. To gain a better understanding of how technological change broke the strategic path of incumbent funeral homes, it is first necessary to obtain insights into the strategic path and how it emerged in the first place. Therefore, based on the narrative we presented, we now reconstruct the two core components of the incumbent funeral homes’ strategic path: the strategic pattern and self-reinforcing mechanisms. Although the details of the narrative are causally ambiguous, we interpret the chain of events from the perspective of strategic path dependence as follows. With regard to the strategic pattern, the initial success of incumbents was based on selling standardized mid-range funeral packages that were characterized by little differentiation among competing funeral homes. Furthermore, the incumbents counted on follow-up purchases by established clientele instead of actively pursuing new customers. As described above, these firms continuously reproduced this product/market combination even as several critical events threatened its success, which qualifies the continued sale of standardized funeral packages to regular customers as the strategic pattern on which the incumbent funeral homes’ strategic path is based (see Koch, 2008, 2011). With regard to the strategic path’s self-reinforcing mechanisms, the cartel-like non-aggression pact among the incumbent funeral homes (pursuant to which the incumbents agreed to refrain from active pursuit of customers and to attract and retain customers solely through reputation) played an important role in bolstering the success of the strategic pattern. Both the non-aggression pact and incumbents’ reputations increased the attractiveness of offering standardized funeral packages to the established clientele in a funeral home’s immediate vicinity. Specifically, as described above, the non-aggression pact curtailed competition in the industry and contributed to generating a steady revenue stream from regular customers. Complying with this cartel-like practice was attractive for the incumbent funeral homes only as long as all their competitors adhered to it and refrained from actively pursuing new customers outside their vicinity, e.g., through advertisements and by differentiating themselves from the competition. Thus, the more that incumbents complied with the non-aggression pact, the more attractive it became for them to offer standardized funeral packages to their existing customer base. This positive feedback on offering standardized funeral packages to regular customers constituted an important self-reinforcing mechanism (Sydow et al, 2009; Schreyögg et al, 2011) that contributed to the emergence and initial success of the incumbent funeral homes’ strategic path. All the critical events in the second phase of the narrative threatened the successful reproduction of the strategic path. However, a closer examination of the impact of these events on the two core components of the strategic path generates further insights into the role that technological change and other critical events played in breaking the strategic path. As Table 2 summarizes and illustrates, the critical events contributed to a greater or lesser extent to destabilizing the core components of the focal strategic path. The 50% reduction in funeral allowances in 1989 had little – if any – immediate impact on the strategic path. As described above, the non-aggression pact remained intact as the central self-reinforcing mechanism of the strategic path, minimizing the impact of this critical event. As the incumbent funeral homes continued to refrain from differentiating themselves (and their offers) from the competition and from actively pursuing new customers beyond their vicinity, customers had hardly any incentive to switch to competitors with similar offerings. Thus, as the incumbent funeral homes continued their compliance with the non-aggression pact, this self-reinforcing mechanism compensated for the impact of the critical event by perpetuating re-purchases by the established customer base for each incumbent. The only tangible difference was that customers had to pay a portion of the bill themselves. However, the strategic pattern of selling standardized funeral packages to regular customers remained intact. Although the effect was not immediate, the market entrance of the discount funeral homes at the beginning of the 1990s did play a role in destabilizing incumbents’ strategic pattern over time. The discounters’ practice of advertising their offers based on (supposedly) lower prices affected customers’ expectations regarding what funeral services should cost. As a result of the potential dissatisfaction with the funeral service that might have resulted from these advertising practices, customers might have become more eager to switch to competitors, thus threatening incumbents’ strategic pattern of offering standardized funeral packages to regular customers. However, as narrated above, these discount funeral homes did not gain much traction when they entered the market. Given that the new market players entered and operated in incumbents’ established catchment areas, they were faced with the tight bonds among the incumbent funeral homes and the regular customers in their vicinity that the non-aggression pact had fostered. Thus, the self-reinforcing mechanism of the non-aggression pact reduced their ability to attract new customers within this regional scope and also disguised an emerging dissatisfaction with the incumbents’ offers. However, breaking the strategic path seemed to become unavoidable with the emergence and more widespread use of the Internet at the end of the 1990s. As described above, this technological change contributed to the collapse of the non-aggression pact. Discount funeral homes used the Internet to pursue new customers beyond their immediate vicinity, i.e., they openly breached the non-aggression pact. As the low-budget competitors were not adhering to the non-aggression pact, the agreement began to lose its self-reinforcing attractiveness because there was little reason for incumbents to assume that other market players would not attempt to entice their “regular customers” to take their business elsewhere. The fact that the discount funeral homes had already encroached onto the incumbents’ catchment areas with little success before the emergence and more widespread use of the Internet destabilized the non-aggression pact suggests that the self-reinforcing mechanisms had sufficiently stabilized the bonds among the incumbents and their regular customers to enable the incumbent funeral homes to continue to successfully (and profitably) reproduce their strategic pattern. However, once the non-aggression agreement was abandoned as a driving self-reinforcing mechanism, the incumbents began to engage in fierce price competition to attract new customers beyond their catchment area, which occurred concurrently with a drastic decrease in revenues and – at least temporarily – ended the successful reproduction of the strategic path. Nevertheless, the emergence and more widespread use of the Internet did not fully break the strategic path of the incumbent funeral homes. As described above, after the non-aggression pact had been destabilized, the incumbents achieved short-term success in recovering the former strength of their strategic pattern by offering their established funeral packages to their clientele for a somewhat lower price and with a greater emphasis on their reputation. These efforts, however, were thwarted when the next critical event, the elimination of the funeral allowance in 2004, further destabilized the strategic pattern. Consumers now had to pay the full amount for funeral services, and the funeral homes perceived this as further intensifying consumers’ price sensitivity. As the non-aggression pact had been destabilized, this self-reinforcing mechanism could no longer minimize customers’ migration to competitors. Consequently, the funeral homes engaged even more intensively in price wars in the face of perceived price sensitivity. In so doing, they destroyed their previous gains and entered a phase of low returns. Thus, although the technological change initiated the breaking of the strategic path by contributing to destabilizing the self-reinforcing mechanism, the next critical event “put the final nail in the coffin” of the strategic path by evoking the decline of the strategic pattern that no self-reinforcing mechanism could avert. Remarkably, comparable critical events that threatened the strategic path before the emergence and more widespread use of the Internet (such as the 50% reduction in funeral allowances) did not fully yield concrete consequences in terms of breaking the strategic path. Indeed, reproducing the strategic path became much less successful only after the technological change and its contribution to destabilizing the self-reinforcing mechanisms, as the self-reinforcing mechanisms could no longer compensate for the strategic pattern’s inefficiencies. However, the technological change alone also did not break the strategic path: Instead, another critical event – the complete elimination of the funeral allowance – was necessary to further destabilize the strategic pattern and doom the strategic path to destruction. Therefore, in summary, we propose that technological change adds to destabilizing the self-reinforcing mechanisms of strategic paths and is therefore necessary but not sufficient to break them. Instead, we advance a process understanding of how strategic paths are broken whereby the phenomenon occurs as a sequence of complementary critical events: one that contributes to destabilizing the self-reinforcing mechanisms and another that destabilizes the strategic pattern. In this paper, we set out to explore how technological change breaks strategic paths. Based on the theory of strategic path dependence, we analyzed the historical rise and fall of incumbent funeral homes in Berlin, Germany, and the role of technological change in that rise and fall. Based on our narrative analysis of this strategic development, we suggest that the primary role that technological change plays in breaking strategic paths is that it helps destabilize their self-reinforcing mechanisms. Our results indicate that self-reinforcing mechanisms can neutralize the impact of other critical events on strategic paths as long as they remain intact. Destabilizing self-reinforcing mechanisms is thus necessary to break strategic paths. However, our findings also suggest that destabilizing these self-reinforcing mechanisms is not sufficient to doom strategic paths to failure because path-dependent firms can try to recover the former success of their strategic path; therefore, breaking a strategic path additionally involves a subsequent critical event that destabilizes the path’s strategic pattern. As the destabilized self-reinforcing mechanisms can no longer shield the strategic path from such a critical event, the event undermines the temporary success of the defensive responses, dooming the reproduction of the strategic path to failure. Our results thus suggest that breaking strategic paths is a process through which both technological and other critical events sequentially destabilize self-reinforcing mechanisms and strategic patterns. Next, we discuss the contributions and implications of our findings as well as potential directions for future research. This study’s first contribution is that it fills a research gap regarding the lack of historical perspectives in IS research. In particular, our paper complements the limited number of historical studies in IS research (e.g., Nolan, 2000) with a narrative analysis of the historical rise and fall of incumbent funeral homes and of the role that technological change played in this strategic development. Thus, our study extends beyond the generally accepted notion in IS research that “history matters” (Fuentelsaz et al, 2012) in that it subjects to systematic analysis the prehistory of the role of technological change in breaking the focal strategic path. In so doing, our study responds to calls for more studies in IS research that devote focused attention to the historical development of contemporary phenomena (e.g., Hirschheim & Klein, 2012; Misa, 2007). Additionally, our study emphasizes that, in seeking to understand how technological change breaks strategic paths, it is first necessary to reconstruct how strategic paths emerge in the first place, i.e., to identify the strategic patterns that are formed by path-dependent firms and the self-reinforcing mechanisms that drive the emergence and reproduction of these strategic patterns. Given the important role played by the historical reconstruction of strategic paths in our study, our paper highlights and reflects the importance of devoting more systematic attention to the historical development of contemporary IS phenomena and reduces the lack of historical perspectives in IS research. The second contribution of our paper is that it develops a more nuanced and systematic understanding of path dependence in IS research. In particular, our study responds to the call by Besson and Rowe (2012) to devote more systematic attention to how paths emerge and break. Our paper specifically performs this task by drawing on the theory of strategic path dependence from organization and management research (e.g., Sydow et al, 2009; Vergne & Durand, 2010). As our paper explains and illustrates, this theoretical approach specifies the core components of strategic paths – strategic patterns and self-reinforcing mechanisms – and it defines path dependence as a process in which firms form and reproduce a strategic pattern as a result of self-reinforcing mechanisms. This definition is arguably narrower than the general understanding of path dependence in IS research that past decisions have an influence on present decisions (e.g., Lim et al, 2011; Zhu et al, 2006). Therefore, the current study offers a more sophisticated and nuanced understanding of and a more systematic approach to the analysis of path dependence in IS research. Moreover, it illustrates the opportunities such an analysis provides: By analyzing how the strategic path of incumbent funeral homes emerged and how this path was broken by technological change, our study does much more than ascribe the rise and fall of these firms in the face of technological change to an idiosyncratic stream of past decisions (e.g., Bharadwaj, 2000; Sambamurthy et al, 2003). By drawing attention to specific self-reinforcing mechanisms and strategic patterns, our study provides a more nuanced explanation for the emergence of strategic paths and the role played by technological change in breaking them. The third contribution of our study pertains to the literature on strategic path dependence in organization and management research. In using this literature to make sense of our narrative covering the rise and fall of incumbent funeral homes in Berlin, our study can also “give back” to this literature (e.g., Yoo, 2013). Specifically, although the extant literature on strategic path dependence has mainly focused on the emergence of strategic paths before and the retention of strategic paths after they are broken by critical events (e.g., Koch, 2011; Dobusch & Schüßler, 2013; Rothmann & Koch, 2014), we specifically focus on and advance a process understanding of how strategic paths are broken. Whereas previous studies of strategic path dependence consider the breaking of strategic paths to be an incision in which technological changes transform a previously successful reproduction of strategic paths into a burden (e.g., Rothmann & Koch, 2014; Sydow et al, 2009), we suggest that breaking strategic paths is a process in which a series of critical events – including technological (but not exclusively technological) critical events – sequentially contributes to destabilizing self-reinforcing mechanisms and strategic patterns. In fact, without an examination of the more extended history of the emergence and destabilization of strategic paths, it might erroneously be concluded that technological change is the only cause of a strategic path’s demise: Our narrative analysis shows that unfolding how strategic paths are broken as a process illuminates the multiple critical events and their (at least partly) causally ambiguous roles in this process. Advancing a process understanding of how strategic paths are broken also implies that strategic paths may be more robust than has been previously suggested; while the previous literature highlights the fragility of the successful reproduction of strategic paths in the face of environmental changes (e.g., Schreyögg & Kliesch-Eberl, 2007; Sydow et al, 2009), our results indicate that self-reinforcing mechanisms can substantially alleviate the impact of critical events on a strategic path as long as these mechanisms remain intact. Thus, our study generally complements the previous literature on the emergence and retention of strategic paths by developing a process understanding of how strategic paths are broken. The process understanding associated with breaking strategic paths also offers certain practical implications. Previous studies that have developed an understanding that breaking strategic paths is an incision (e.g., Sydow et al, 2009) draw a dramatic picture of critical events and the necessity for (but inability of) path-dependent firms to appropriately respond to such events. However, a process understanding disarms the adverse impact of critical events on strategic paths to a certain extent. In particular, our analysis suggests that strategic paths can be quite resilient for extended periods of time because self-reinforcing mechanisms can substantially alleviate the adverse impact of critical events on such paths, which implies that firms do not have to implement strategic change in the face of every critical event that threatens the successful reproduction of a strategic path. However, there is a greater need for action when the self-reinforcing mechanisms of strategic paths are destabilized; in this case, further critical events may destabilize the strategic pattern and even eventually break the strategic path because the self-reinforcing mechanisms can no longer shield it from adverse impacts. Given that the destabilization of self-reinforcing mechanisms marks an early stage in the process through which strategic paths are broken, path-dependent firms have a time window in which they can take action to avert the harmful consequences associated with strategic paths becoming broken. Path-dependent firms may identify the beginning of this time window by effectively monitoring critical events and their impact on the core components of strategic paths (see Schreyögg & Kliesch-Eberl, 2007). As our results indicate, it may not be enough for path-dependent firms to use this time window for “horizontal creativity” (Rothmann & Koch, 2014), i.e., defensive responses that do not change the strategic pattern as such but that aim to restore its success, because the former destabilization of the self-reinforcing mechanisms cannot prevent a subsequent critical event that attacks the strategic pattern from eventually breaking the strategic path. Instead, path-dependent firms should interpret the destabilization of self-reinforcing mechanisms as an early warning signal of their (potential) upcoming demise, which they can use as a starting point to generate strategic alternatives to their established strategic pattern. Hirschheim and Klein (2012, p. 190) emphasized that “a historical reflection [is] biased and incomplete, as it necessarily must be.” Although this notion complies with the suggestion from Avison et al (2016) that the resulting multiplicity of interpretations of such narratives stimulates scholarly debates and promotes theoretical progress, it also indicates that our study has a number of limitations that might offer interesting directions for future research. Most notably, following Langley (1999, p. 969), the type of narrative approach adopted in this paper is “high on accuracy [but] lower on simplicity and generality.” Thus, although our qualitative study aims to generate and develop rich empirical insights into how technological change breaks strategic paths as a complex, contemporary phenomenon, our research results are not statistically generalizable (Yin, 2014). In fact, the setting of the funeral industry is unique in several respects, such as with regard to the emotion-laden nature of firm–consumer interactions that intensified the bonds among consumers and funeral homes because of consumers’ reduced willingness to compare competing offers, thus making the challenges of responding to technological change even more visible. However, with regard to the phenomenon of interest, i.e., the role of technological change in breaking strategic paths, the path-dependent firms in this industry that were affected shared a fate that was similar to many other incumbents in other fields, such as the book industry (Schreyögg et al, 2011), the camera industry (Lucas & Goh, 2009), the music industry (Oestreicher-Singer & Zalmanson, 2013), and the newspaper industry (Karimi & Walter, 2015). As the demise of these businesses also seems to have begun with the destabilization of self-reinforcing mechanisms – such as the advertising–circulation spiral in the newspaper industry (Rothmann & Koch, 2014) and the strong complementarity of cameras and films as a “razor-blade business model” in the camera industry (Tripsas & Gavetti, 2000) – our findings seem to be transferrable to path-dependent firms that are affected by technological change in different contexts. However, there is uncertainty with regard to the length of the time window between the two complementary critical events that sequentially destabilize the self-reinforcing mechanisms and strategic patterns: Do path-dependent firms always have several years available to escape the harmful consequences of breaking their strategic paths? Under which conditions may the destabilization of the two core components of strategic paths coincide and overlap? Does technological change contribute more or less to the destabilization of self-reinforcing mechanisms under certain conditions? These are interesting questions for future research that will hopefully be coupled with compelling answers. Furthermore, given the fruitfulness of historical studies, which is highlighted by our paper, we encourage future research to continue examining contemporary IS phenomena and firms’ challenges in seeking to address them by reconstructing the historical background of these challenges. To this end, both more traditional and more innovative analytical procedures may also be available, such as forms of discourse analysis (Koch, 2011) and biographical approaches (Williams & Pollock, 2012). Furthermore, we agree that path dependence is a widespread contemporary phenomenon that imposes challenges on incumbent firms in the face of technological change (e.g., Besson & Rowe, 2012; Singh et al, 2015; Yoo et al, 2012), and we hope that the more specific definition of path dependence that we adopted from organization and management research will help future research more systematically explore path-related IS phenomena. However, we must also note that not all incumbents are necessarily by path-dependent dynamics (see also Pentland et al, 2012). More specifically, as a consequence of defining path dependence in a narrower sense (e.g., Sydow et al, 2009; Vergne & Durand, 2010), there may be alternative reasons for the hyper-stability that is observed among long-established firms, such as escalating commitment (Staw, 1981) or imprinting (Stinchecombe, 1965). These concepts are not defined in terms of strategic patterns and self-reinforcing mechanisms. Therefore, our findings are not readily transferrable to incumbents that struggle with technological change for these reasons. However, these alternative concepts also impose challenges on incumbents resulting from historical developments and thus underscore the need for further studies that reconstruct the historical roots of these challenges. Therefore, to develop further knowledge regarding firms’ contemporary challenges in the face of technological change, we invite future research to extend our findings by escalating the commitment to and imprinting through historical studies. The authors are indebted to the responsible editors as well as to three anonymous reviewers for their thoughtful guidance. Furthermore, the authors thank participants at the 23rd European Conference on Information Systems (ECIS) in Münster, Germany, for their helpful comments. An earlier and less-developed version of the manuscript was published in the ECIS 2015 Proceedings. Avison D, Malaurent J and Eynaud P (2016) A narrative approach to publishing information systems research: inspiration from the French novel tradition. 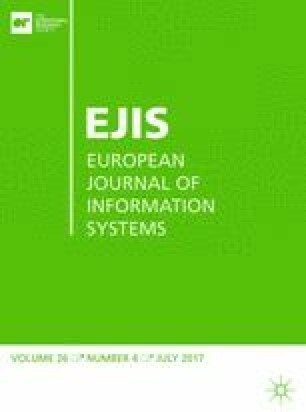 European Journal of Information Systems. doi: 10.1057/s41303-016-0022-1.